According to Intel’s long term roadmap, Penryn will become the last “Core” (NGMA) microarchitecture, but it will not become the last 45nm generation. A new architecture, based on the Nehalem core, will make an appearance in 2008. This Core successor, dubbed by many as NGMA2, will essentially take all of the 45nm manufacturing principles of Penryn and apply them to the totally new Nehalem architecture. This transition will be very similar to the P6+ transition with Yonah from Dothan to Conroe. If P1266 was radically different from the 65nm Core CPU, P1268 takes what is normal on Penryn and throws it out the window. The first P1268 processor is what Intel has publically announced as Nehalem-C. Nehalem-C is still based on the Nehalem (NGMA2) microarchitecture, but is a die shrink from 45nm to 32nm. P1268 employs all of the neat manufacturing techniques found on P1266, but uses a totally different lithography process called EUV, or Extreme Ultraviolet. Although it sounds trivial to swap a traditional DUV lithography setup with an EUV one, there is a fundamental problem with EUV that prevents foundries from doing so; the EUV wavelength is so small at 13.4nm that virtually every material absorbs the wave including the lenses and atoms in the air. EUV must be done in a vacuum with reflective surfaces instead of lenses to focus and redirect the lithography. 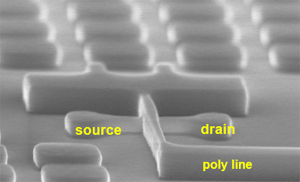 The photo is an SRAM sample under the 45nm process. But it’s just cool – today’s latest chips are at 65nm. And as the article mentions, EUV will take us down past 32nm to 13.4 nm! We are really at the cusp of nanotechnology-scale there. And all within five years. Neat stuff. More or less. The whole industry ran smack into a wall in 2002, but it’s getting back on track now. The next order-of-magnitude is signed and sealed and just waiting to be delivered. Conroe is looking good. I just bought an Athlon 64 for home, because it’s good enough for what I want to do, but I’ll be looking closely at Conroe for my new servers.